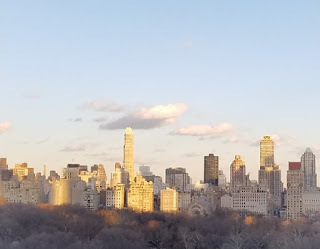 Sooo...picking things up in mid-March, I headed to NYC en route to the UK. 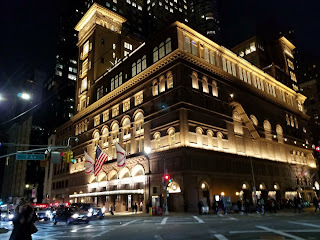 I spent 3 nights in New York. I saw two stage shows, one movie and went to the Merchant Museum, which was my favorite activity this trip. I also got my shoes shined and my eyebrows waxed, but I didn't actually go to any restaurants, which is unusual for me in New York. I ate almost exclusively from the Whole Foods at Columbus Circle. It's located in the Warner Building, and there are a couple of huge statues, one male and one female, that I didn't remember seeing before...which doesn't necessarily mean they weren't there before, of course. While Whole Foods is more expensive than most grocery stores, their selection of hot foods is not only excellent, but far cheaper than most NYC restaurants. Since you pay by weight, you can mix and match a little of this and a little of that all into one carton, so you can customize your meals according to whatever you feel like eating. I seriously love doing that. Both my theater experiences were just slightly disappointing. 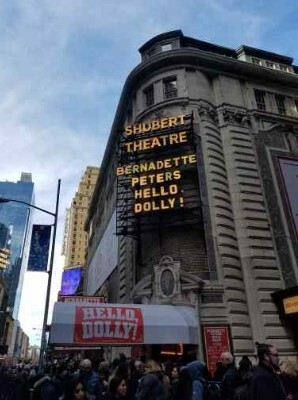 I saw Hello Dolly with Bernadette Peters, who was absolutely amazing - not just for her age, just amazing, period. The rest of the cast was really good, as well, and the production values were top notch - set, costumes, everything. However, in my opinion, either that show did not age well or the way they told the story was off. 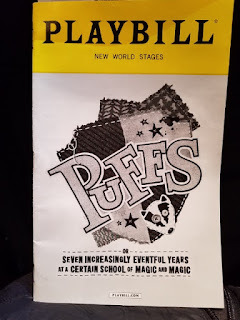 Because, in spite of how well everything was produced and how talented the cast was, I was often bored during the show. Since the original show was already set in the past, I think it was something about this production that just didn't hit the mark. I'm not sorry I went, I'm really glad to have seen Bernadette Peters hit this high note of her career. No one deserves it more. It just wasn't one of my favorite theater experiences. Puffs, on the other hand, had the most minimal production but still kept me interested for the most part. A Harry Potter satire/parody, it was a fun exercise in catching all of the series references. But the story and performers were amusing enough, as well. For the most part, anyway. It ran on a little too long, and the silliness did get a little wearing after a while. On the whole, though, I don't regret the experience. I saw the movie Death of Stalin because I had less than 2 hours to kill before picking up my bags to leave for the airport, and I couldn't think of anywhere else to go from where I was in that length of time, except for seeing a movie. Given that the tickets were $15 each, I didn't think it was a good idea to see Black Panther for the 4th time, but I wished I had when I saw that Death of Stalin was offered for free on my plane to London. You know, I often went for many months - maybe even years - without seeing a movie. And it still doesn't seem like I should be doing things when I travel that I can just easily do at home, as though all my travel time should be used for different or "special" experiences. Yet, seeing a movie in other destinations is one of my favorite things to do. Although, I have to say, I prefer not to have to pay $15 for the privilege. But I will, in New York or London or anywhere else, if that's what it takes. Still, it makes me cringe when I think about the clean, comfy theaters in Mexico City where I can see a movie for under $5 and my popcorn/water is only $3. 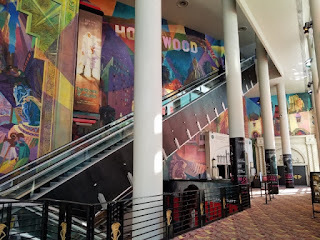 I did like the AMC Loews Lincoln Square, though it took me a while to find the ticket office. The signs were not particularly helpful. But it is a colorful and comfy cinema, and I enjoyed myself. The entrance to the Ladies Room was particularly awesome, I thought, with its black and white photos of legendary actresses from the past. 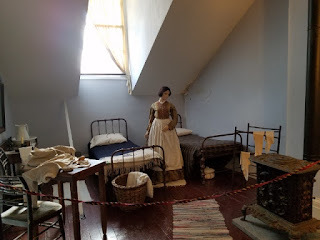 The photos I most regretted losing from my phone were those of the Merchant's House Museum in New York. 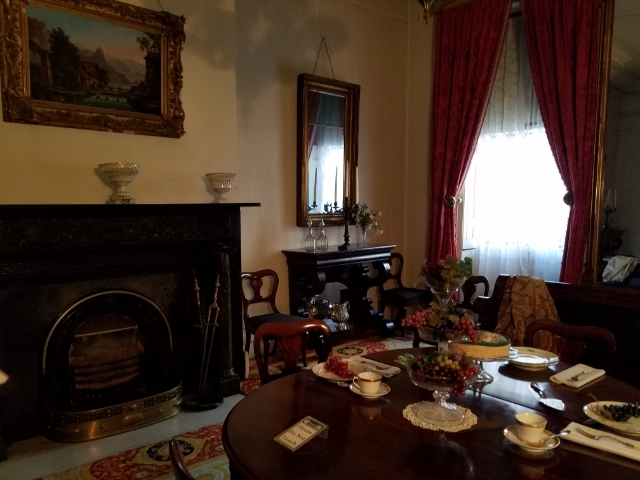 It's the home of a wealthy merchant that has been preserved much as it was when the family lived in it back in the 1800s, including china on the dining room table. As I've said before, I love these kinds of places. Especially when they let us see the servants quarters, so we can imagine how it was run with so many classes of residents under one roof - husband and wife, children, upstairs and downstairs servants. While it is certainly a spacious house, and easily worth over a million on the current real estate market, it is still a row house and by no means enormous. Since it is the only one of its kind from that period in NYC that is preserved as it once was, I found it fascinating. There was a fabulous book, with all kinds of information, even floor plans. I took photos of every page, so I could go back and read it at my leisure, with the photos for comparison. But the low resolution images I'm left with make that impossible now. I may go back again next time I'm in New York. There's *always* a next time. 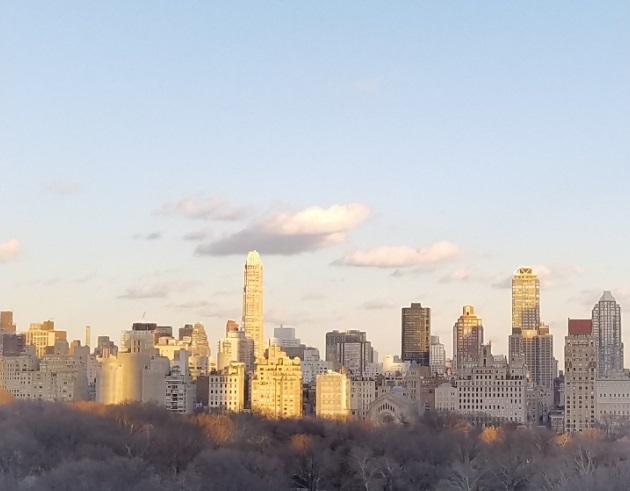 No matter what I do in New York, or how satisfied I am with it, I still love being in that city. Even if it's doing nothing special, just running errands, NYC has such a unique energy and there is so much to see just while just walking around. Seeing Carnegie Hall, for instance, never fails to thrill me, especially when lit up at night. 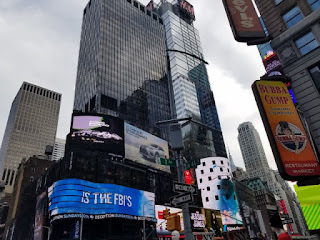 So, while my entertainment choices may not have quite lived up to my expectations, I still thoroughly enjoyed being in New York, and will always be excited to go back. ‘Owic Car rental is Providing Car Rental Service for Same day agra tour by Owic from Delhi By Car or Luxury Vechiles Now we are Become a Expert for booking Same day Agra Tour from Delhi Daily . Owic Car rental is the registered Company that is the major reason for the reliability of the Company. It offers the luxury cars or cabs for tourist by offering several facilities. This Company target long term goal for offering services for one way trip or round trip cab. Company serve mostly for one way Cabs service, that refers as you have to pay only for half way and the payable charge will be half. The main aim of car rental Company is to strive to build a reputation of our Customer Friendly firm in India. We give our first priority to safety, quality and time. You will find the quality car that drive you safely and consume the time by giving fast service.